March 30, 2010 -The United States Department of Agriculture (USDA) Agricultural Research Service, in conjunction with the Apiary Inspectors of America, is conducting a voluntary survey to determine the bee colony losses for the 2009/2010 winter. This survey is not just for beekeepers with huge numbers of hives, even small-scale beekeepers are encouraged to participate. The survey takes approximately two minutes, and is completely anonymous. managed by hobby beekeepers. Based on Borst’s local knowledge, as many as 90% of the local beekeepers may have elected to not register with the state — which is where the national surveys start for the data. 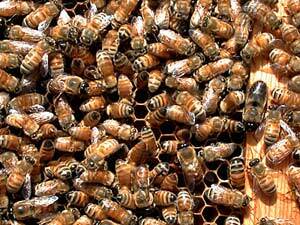 If you know a beekeeper with one hive or one hundred, share this information with them. Good research requires good data. The Apiary Inspectors of America and the USDA-ARS Beltsville Bee Research Laboratory are seeking your help in tabulating the winter losses that occurred over the winter of 2009-2010. This continues the AIA/USDA survey efforts from the past 3 years which has been important in quantifying the losses of honey bees for government, media, and researchers. This year’s survey is faster, easier and does not require your time on the phone. It is all web based and automatic, just fill and click. This survey will be conducted until April 16th, 2010. We would also appreciate it if you would forward this email to other beekeepers. The more responses the better. If you have any questions or concerns please email beeloss@gmail.com, or Honeybee.Survey@aphis.usda.gov. Please contact your Senators and ask them to sign on to a letter by Senator Boxer in support of vital research on agricultural pollinators. Please read below for additional information. The deadline for Senators to sign on to this letter is Wednesday, May 6. Providing funding for research into the causes and remedies of honey bee and native bee declines is a critical step in pollinator conservation. Please take a moment to call or write your Senator, let them know how important pollinators are, and ask them to 1) support this appropriation and 2) contact Senator Boxer’s office to sign on to this important letter. Senator Boxer has written a letter requesting that the Agriculture Appropriations Subcommittee allocate $20 million in Fiscal Year 2010 for pollinator research projects as authorized in the 2008 Farm Bill. These funds will increase the resilience and security of our farming systems by supporting vital research into Colony Collapse Disorder (CCD) in managed honeybees and to promote the health of honey bees and native pollinators through habitat conservation and best management practices. As you may know, the 2008 Farm Bill includes language authorizing $100 million over five years to further our scientific understanding of the essential agricultural services pollinators provide our nation. The letter only seeks to fully fund critical provisions that were recently signed into law through legislative consensus. Managed and native pollinators, such as honey bees, bumble bees, and other native bees, are needed for the production of over $18 billion (and possibly as much as $27 billion) per year in agricultural products in the U.S. These animals are required for 35 percent of the world’s crop production. Yet, total pollinator spending at USDA in the 2008 Fiscal Year accounted for merely 0.01 percent of the agency’s budget. Without pollinators, our current yields of alfalfa, almonds, apples, cherries, cranberries, blueberries, kiwifruit, strawberries, melons, squash, peppers, peaches, pears, plums, carrot, onion, and other seed crops, would not be possible. Arising in 2006, the as yet unexplained phenomenon termed Colony Collapse Disorder (CCD) diminished our nation’s already dwindling honey bee colonies, and highlighted our relative ignorance of the complex systems that support animal pollinated food production. It is vitally important to conduct research to better understand and solve this problem. Studies in other developed nations have well documented a diminished presence of honey bees and other vital pollinators in interdependent agricultural and ecological systems, but much information is lacking in the U.S. A major conclusion of a comprehensive study by the National Academy of Sciences in 2007 found that for most North American pollinator species, long-term population data are lacking and knowledge of their basic ecology is incomplete. Funding for pollinator research will protect the health, future, safety, and sustainability of our nation’s most nutritional food crops. These funds will ensure that we base our sustainable future in agriculture on a more comprehensive understanding of the science that supports it. The Xerces Society is an international, nonprofit organization that protects wildlife through the conservation of invertebrates and their habitat. For over three decades, the Society has been at the forefront of invertebrate conservation, harnessing the knowledge of scientists and the enthusiasm of citizens to implement conservation programs.